Nothing binds a group like a collective challenge. We let you run your meeting with employees, staff or faculty in a beautiful, spacious setting, providing you with screen, projector, flip charts, table & chairs. We lead breakout movement sessions. Your choices include: Here are SOME of your options: Yoga for concentrated calm. Nia for upbeat, energizing fun. Hula for an island theme. Aerial Yoga for a fit, adventurous group! Catering available upon request. We are a vegetarian, alcohol free facility. Let us organize your holiday, work or family party – We will save you the hassle and make it a lot of fun for your attendees! When your guests have a great time and leave feeling even better than when they arrived, your event will be remembered as a success. Surprise them with something new and healthy – dancing instead of candy? Yoga instead of cake? Choose from a variety of offerings to match your employees, friends, or family members interests. We lead your group in hula favorites, Finger light dancing, bollywood, yoga, ecstatic dance, Nia, bellydance, and even Aerial Yoga! Try this unique and trendy way to bond with friends, family and colleagues. Make it a positive, healthy and fun experience for all. We will make sure to get you moving! People are affected by their environment – Our space feels relaxing, and our guests leave here feeling both calm and uplifted. Holidays, birthdays, or other special events don’t need to necessarily mean overindulgence. We offer nourishing, comforting fare, always healthy and vegetarian. We offer Mocktails too–delicious, fizzy drinks of seasonal flavors with no hang-overs! Optional Extras: Decor, Cake, Catering, Photographer, Tables, & Chairs. Let us send Moving Moments your way! 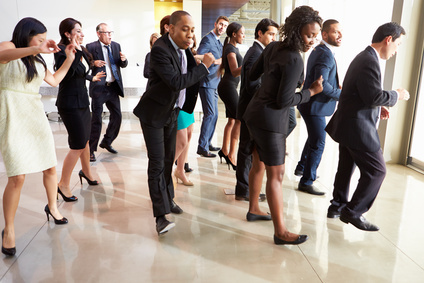 Choose any of our movement formats – such as Bollywood, Yoga or Hula – and we will transform your workplace into the Groove Zone! Trust our fun-loving, professional movement instructors to get your group charged up or mellowed out. Throwing a healthy, active bridal shower is just what the bride needs to regain some of her sanity after months of wedding planning. We offer a refreshing way for brides to relax with friends and family, eat healthy and MOVE! Everyone has lots of fun, both the bride and the guests! Choose from a variety of movement forms to match the bride’s personality. Some ideas are: Go Island style with Hula, Chill out with Yoga, Catch the beat with Bollywood dance, Fly high with Aerial, Have a blast with Nia or Twirl the Hula Hoops. Our hula teacher can teach the bridal party a hula they can perform at the wedding reception. Keep the healthy theme with vegetarian and alcohol-free refreshments and lovely dessert treats. Benefits to the bride: this party will help her remain calm, relaxed and present, allowing her to fully enjoy every moment of her big, life-changing event. To book option that suits your needs, please fill out the form below. You can also reach out to us via phone and we would be happy to assist you in planning and hosting the event that your guests will remember!